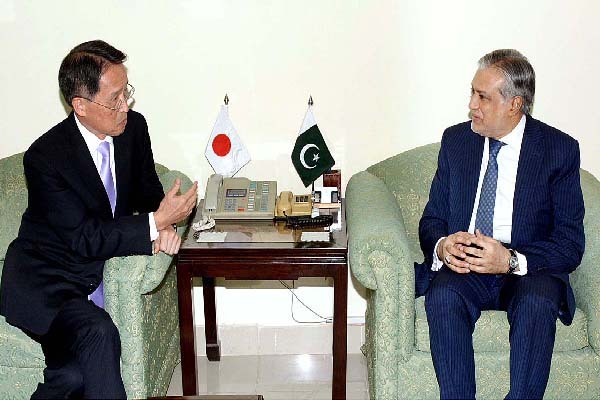 ISLAMABAD, Aug 11 (APP): Ambassador of Japan to Pakistan Takashi Kurai called on Federal Minister for Finance Senator Mohammad Ishaq Dar Thursday here and discussed prospects of economic cooperation. Kurai congratulated Ishaq Dar on the successful completion of the recent IMF Extended Fund Facility Program. He shared that the completion of the IMF Program is indicative of the reforms that Pakistan has undertaken and this is highly appreciated by the Japanese institutions and it would bode well for future investment prospects in Pakistan. the Japanese Ambassador to Pakistan and said that Pakistan has been moving ahead on the growth trajectory and there are more bench marks to be achieved, said a statement issued here. achievement and would lead to the growing international confidence in economic stability achieved by Pakistan. which are in the pipeline and can be considered for mutual co-operation and Japanese economic assistance. The meeting was attended by the Secretary EAD, Secretary Water and Power and high officials of Finance Ministry.